All the sudden it was spring in London today. For three days I have been freezing but today I was sweating. (Maybe that was just hot flashes!) Bryan wanted to visit the Borough Market again...we went last year on our trip to London. This market is right at the base of the south side of the London Bridge. We went to eat. Last time this booth was too crowded for my patience but today I only waited about five minutes. Steamed potatoes with melted cheese. There is a brick of cheese sitting under mini broilers. The top layer of melting cheese is scrapped off and placed on top of the potatoes. Fresh black pepper and pickles are added...I went without the pickles. Bryan took a little longer to get a bratwurst. We shared the bratwurst and the potatoes...but the gluten-free red velvet cup cake was all for me. The Borough Market has mostly food products...fresh produce, meats, fish and cheeses. Then there are all the prepared-food vendors. Very busy place...I did mention there were a lot of people there. We walked back across London Bridge. Far in the distance is the Tower of London is on the left side of the Thames in this photo. The water was very rough...it was windy. We ran into another market on our walk. Old Spitalfields Market. This was a large, covered open area surrounded by in-place eateries. Loved this display of a permanent shop on the outskirts of the market. The interior with a temporary vendor section. Most of the vendors had clothing....some of it very original. 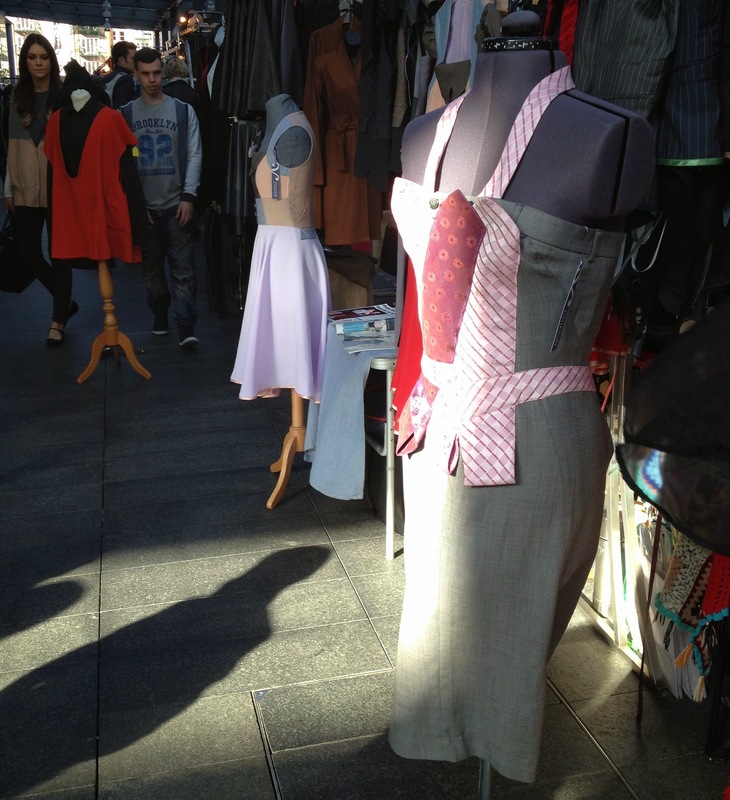 This booth had dresses made with men's ties. A lot of vendors would not allow photos. It is Mother's Day in the UK tomorrow. So many pretty flowers. We wandered through some more crowded streets on our way to the hotel. Too pretty to be inside anyway! We ended our day with dinner at an Indian restaurant, Dishoom. We got a seat by the cooks. The food was fabulous and it was great fun to watch the meals being made...very quickly. The hotel we stay at in London has fast, free internet so I took advantage and blogged before our busy morning tomorrow to ride the train back to Paris. You may not hear from me again until I make it back to Alaska...just a few more days! Finally...a day with a partner to sightsee! 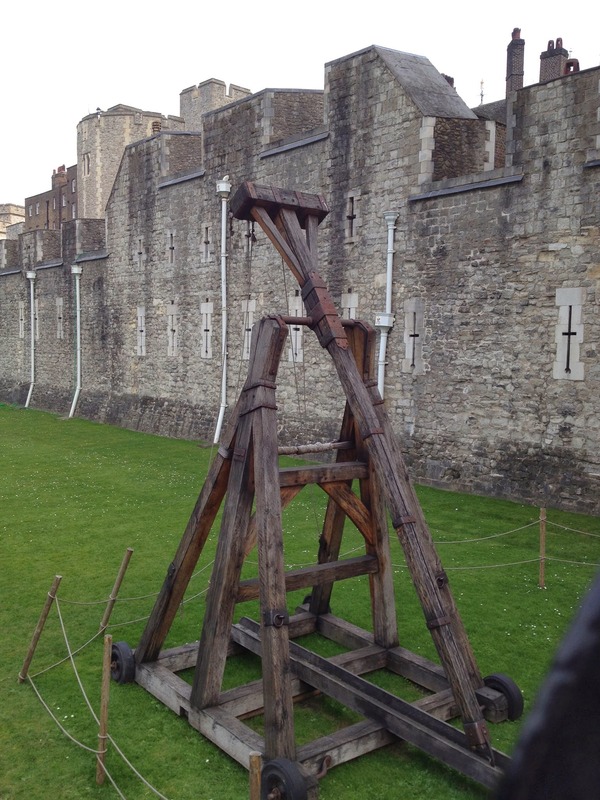 My husband can be so reluctant to do anything that is typical tourist fare...so I picked something I thought would interest him...a tour of the Tower of London. He started complaining right away but I told him the Tower of London is where Henry the VIII's wives were executed and traitors were tortured. That got him more in the spirit of being a tourist. We started out by walking there from our hotel...and though it was before noon...my husband just had to stop at a British pub along the way. Pub hopping is a constant pursuit of my husband's whenever we are in London. At least this pub was still serving breakfast and the folks already eating there had some tasty looking food so we ordered one traditional British breakfast to share with a side of scrambled eggs for me. Two eggs, a large mushroom, 1/2 a tomato, two slices of ham, two sausages, baked beans and two slices of thick toast...and a Guinness for my husband. I got in the spirit too and had a Bloody Mary that desperately needed a shot of tabasco but none to be had in this pub. Now fortified, we continued our walk through a very cosmopolitan skyscraper area to the Thames where we found the Tower of London in the distance. We crossed a lovely little park with gorgeous flowers...I guess there is a little bit of Spring in London. We entered from the back side of the Tower of London, overlooking a moat that is a lovely grassy area now. This would make an excellent doggie play area. Our first sign of warfare weaponry...my husband started to perk up...a catapult. Let the Monty Python humor begin! 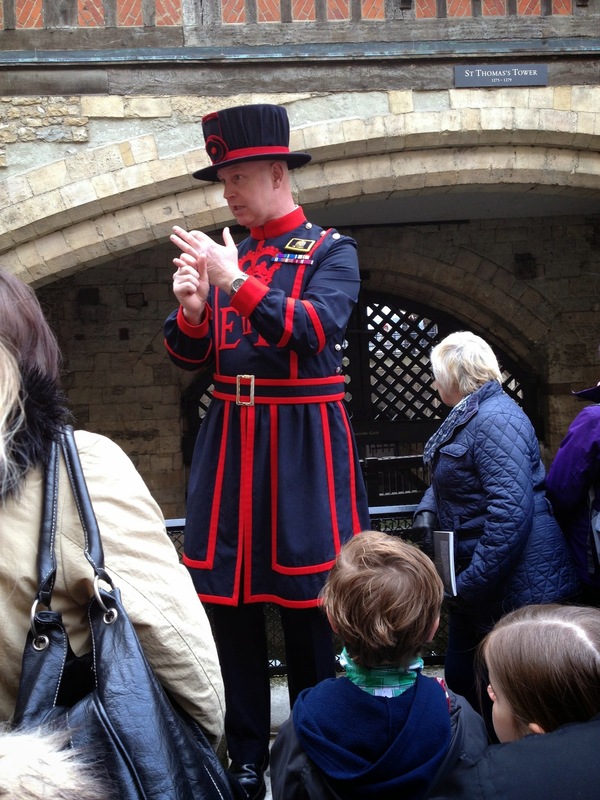 Right way we joined in on a free walking tour narrated by a Yoeman Warder. This tour was highly recommended in our Rick Steve's London book and as usual...that book gives great touring advice. Our Yoeman, Clive, was very entertaining. Here we are in front of the "Traitors Gate," the water entrance to the tower. This is where Anne Boleyn and her daughter, Elizabeth, entered the tower for their imprisonment. 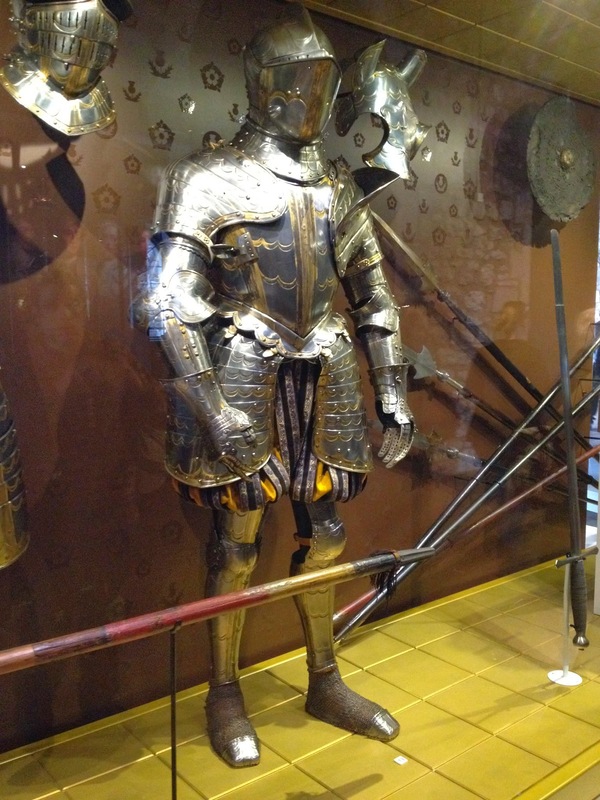 We toured the Royal Armory. There were lots of weapons for my husband to enjoy. 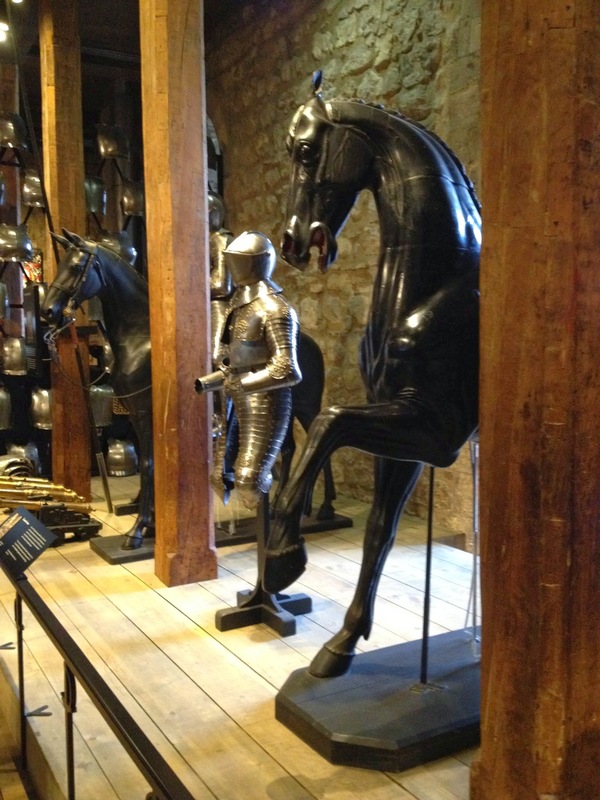 Several full-sized wooden horses were on display to show all the armor on the horses too...I can't imagine how much weight these horses had to carry once they and their riders were all out-fitted. We got to see the crown jewels...very impressive...neglected to get a photo of any of them...but just like you imagine they would be...lots of priceless gems. The armory museum is housed in the White Tower which is where this castle began its construction under the direction of William the Conqueror in 1077. You can walk through the entire building. The outer walls are 15 feet thick at the base and narrow up to 11 feet wide at the top of the walls. Of course outer buildings were added throughout the years. To the left is a small church where all the bones of the executed traitors were placed in unmarked graves under the floor of the church. To the right...our Yoemen didn't talk about these buildings but there were barracks for the armies so one would have to guess some of these buildings were for that purpose...definitely newer construction. The view from the outer walls...across the Thames River. This is Tower Bridge, build in 1894. We made our way back to the hotel...with another pub stop along the way. Then a little rest before heading back out to see a show at the Prince of Wales Theater. We saw, "The Book of Mormon." It is a musical written by the creator/writers of South Park. I have sons who have watched that show for years...I've seen an episode or two. The play was hysterical and I felt a lot of guilt while watching it. Very thought-provoking entertainment. The two lead actors were American and were fabulous. I just can't tell you how shocked I was by all the wonderful singing and dancing...mixed with horrifying vulgar language. My sons did warn me! Very South Park...who knew they could write a musical? We are in jolly old England! 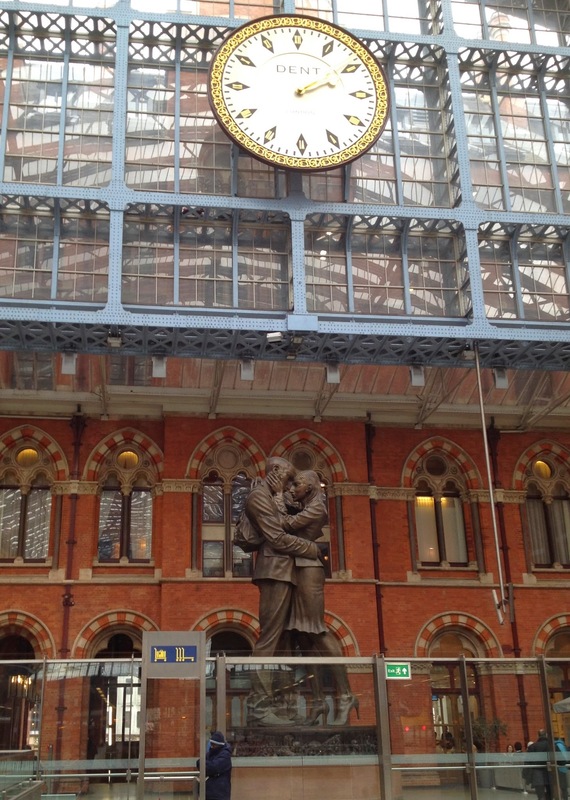 We took the train from Paris...through the chunnel...to London's St. Pancras station. Upon disembarking there is a lovely statue that greets you as you leave the train platforms for the main station...not a great photo but hope you can see the statue of the couple...it's huge and the photo just doesn't give you an accurate perspective. Bryan has a one day conference here so we are staying until Sunday. Today I was on my own and hit the National Gallery. Lots of great European art to be seen here from the 1300s through the early 1900s. No photos allowed! Rembrandt, Van Dyck, Reubens, Renoir, Monet, Van Gogh...just to name a few. I'm definitely getting my art fix this year. Here's a view of Trafalgar Square looking out from the entrance of the National Gallery. A sea of people! It's still feels too much like winter here. We were greeted with rain mixed with snow upon our arrival yesterday. I'm still battling a sinus infection. Might require a doctor's visit at some point. I was so thrilled to be able to walk into a pharmacy today and get Sudafed. I did get some great cold medications from a Paris pharmacy but somehow in Madrid things went bad again! I'll be in the USA in a week. I am ready to get to my Alaska home but only after a few more days of fun in London. Poor WiFi connections at our hotel have impacted my blogging...I'm still around! We have been in Madrid the past week. Yesterday we did a day trip by train to Toledo. The drive would have been two hours but the high speed train got us there in 20 minutes. Toledo was the capital of Spain before Madrid. 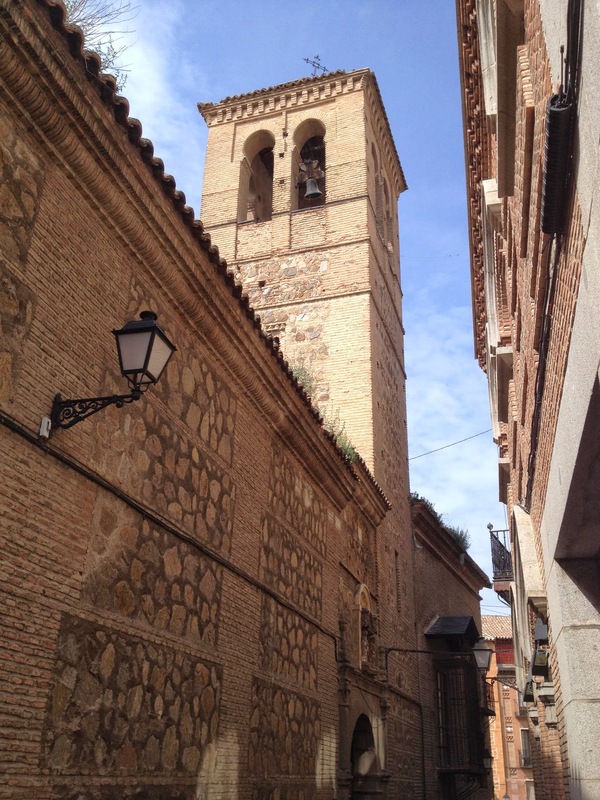 We went directly to the old part of the city which sits on the highest terrain in the area. The fortress wall is still visible around the base of the city. There were lots of knife shops...my husband was thrilled to do some window shopping. One of many lovely churches. The church had a courtyard with an unusual combination of plants...a blue spruce and several orange trees. Toledo had large populations of Muslim, Christian and Jewish populations. The Jewish populations was known as Sephardic Jews and thrived in Toledo for hundreds of years. The phrase, "Holy Toledo," is credited to the Sephardic Jews who immigrated to America and considered Toledo the holiest of Jewish cities. We came upon an historic synagog, a much simpler structure than the catholic churches. 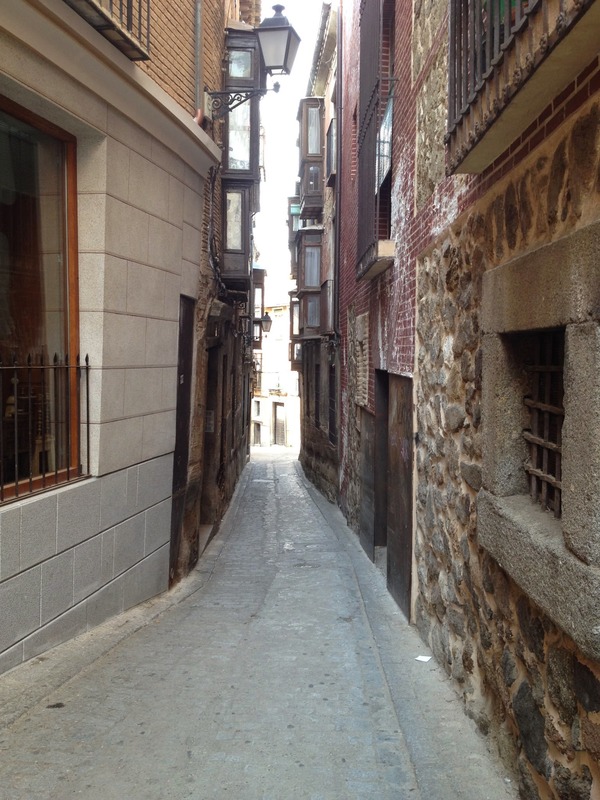 More wandering through narrow streets. All that walking required a few stops to boost our energy. We got a nice little treat with our beer at one sidewalk cafe. Our little sandwiches had a thin slice of a potato and egg baked mixture. Every now and then we saw some interesting tile work. Then it was time to start making our way down to the train station. 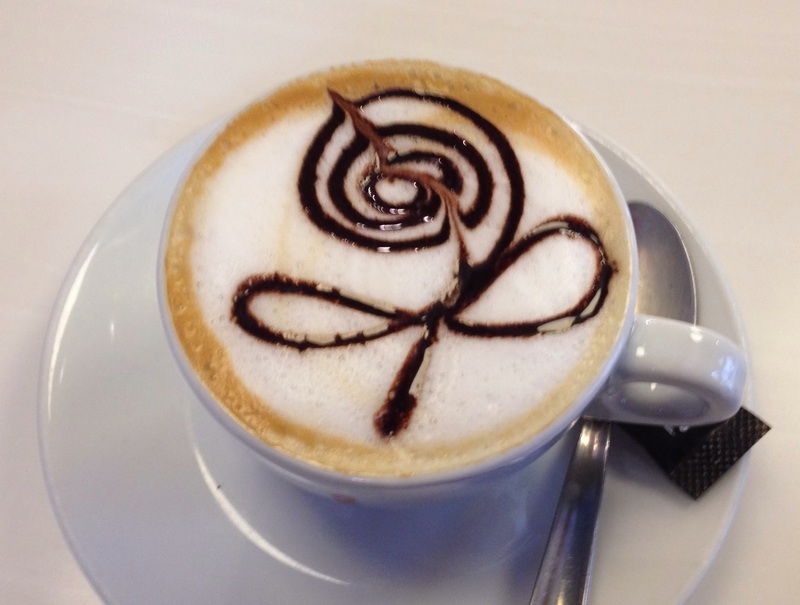 I had a wonderful cappuccino at the solitary snack bar of the train station. I have been visiting art museums in Madrid so not much to show you from those visits as photos are not allowed. Everything was going along so smoothly...and then I got a terrible cold! I have been doing a whole lot of nothing for the past week but I am finally feeling better. We have a trip to Madrid in the coming week so getting well is very important. My husband has been out of town for most of my illness which is probably just as well...I really don't want him to get this nasty thing! But he was home yesterday for 24 hours and brought me some lovely flowers. First...Thank You to everyone who took the time to let me know about the manufacturing problems with Lite Steam a Seam 2. 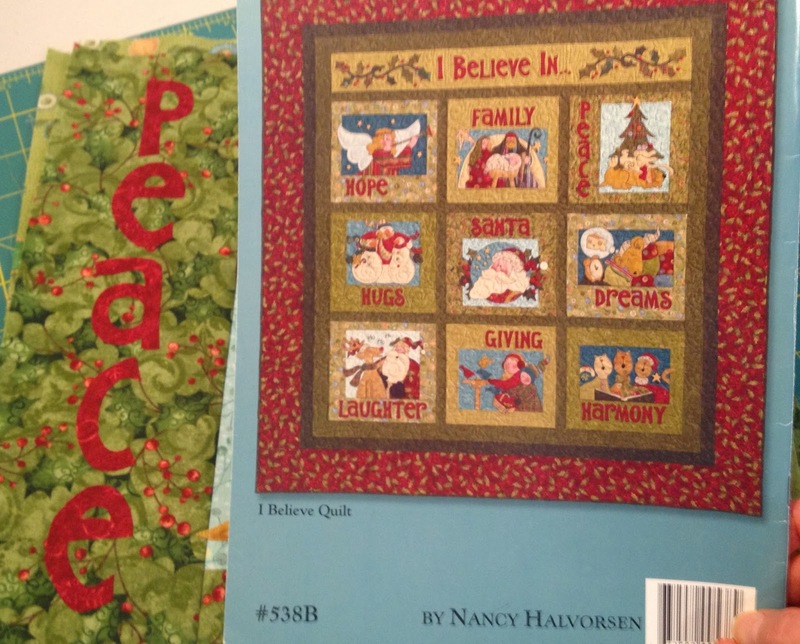 Karen of Quilts...etc. has a link to an article about all the details. I am amazed this has been going on for so long and sure hope it all works out soon. I wish I could naturalize bulbs like this in Alaska...I've never had any luck with that! Here are some crocus...they are about done with their run this season. lots of people to share the green space on a pretty day. Many of the green lawns are off limits. When a space is free for foot traffic...it gets full when the sun is out. Stitching away on the Christmas felt banner. It looks like I will be going to Bali in late May. I'm going with a non-quilting friend but I know she will be happy to do some batik fabric shopping. We are trying to research everything that we are going to try and do. I think we will be there for at least a week...maybe a little longer! On the way we will spend a few days in Hong Kong. I am very excited...a trip to Bali has been on my bucket list since I was tricked into that "not-a-vacation" rafting trip through the Grand Canyon three years ago. The borders are done! Now I have four quilt tops to take back to Alaska for quilting. What to work on now? I guess I will work on another UFO. I have all the fusible appliqué in place...just need to outline with a black blanket stitch by machine. I will also work on getting the fusible appliqué done of this UFO too. I am down to my last two yards of fusible web from a box of 25 yards. I spent all last summer searching on the internet for a new box but it was impossible to find. If anyone knows where to order this...let me know!